Last December, the Figures of Speech 'Department of the Bleedin' Obvious' came to the bleedin' obvious conclusion that the resolution of the Ireland border was a very great problem for the future of the Brexit negotiations. Possibly the greatest problem. The British people were told not to worry: Theresa May's waffled and incomprehensible position was not 'legally binding'. There would be more thinking and more meetings. As we pointed out then, the problem is quite intractable. A border is a border, whether a dry border on land or a wet border in the sea or a lake or even down the middle of a river. Whether you drive across it or sail across it or cross a bridge over it doesn't make any difference – the border and customs controls are the same in every case. As far as the UK is concerned, nearly all of its border is a sea border. The only land border is between Northern Ireland and the Republic of Ireland. If the UK is to leave the EU, it will have to take control of all its borders – including the land border in Ireland. That is bleedin' obvious to anyone. This will make the Republican Irish squeal, and particularly the Republican Irish living in Northern Ireland, who have fought so hard for the political and economic unification of the island for more than a century. Political union has not been achieved yet, but for all practical economic purposes the Republicans are currently treating the two Irelands as a single country. With a hard border, instead of the present fudged unity – a.k.a. let's not lift that stone up – the separation of the two Irelands will be final. Nearly a century of bombing, murder and mayhem by the IRA will have been completely pointless – and may very well kick off again. If on the other hand the border is softened as a special case to favour the Republican Irish, the Loyalists in Northern Ireland will be politically decoupled from Britain, which is what they have fought so hard against for more than a century. Instead of the present fudged separation – a.k.a. let's not lift that stone up – the unification of the two Irelands will be final. Nearly a century of bombing, murder and mayhem by the Ulster diehards will have been completely pointless – and may very well kick off again. Ulster diehards? Oh, the ones keeping May's government afloat. Theresa May has not yet been able to deliver a Solomonic judgement on this point – or, in fact, any decision at all. She foolishly took part in the idiotic all-night negotiation session last December – you remember, the one which was 'not legally binding' – and now the EU has got its foot in the door over the issue. It owns it, in fact. In a combination of sleep-deprivation and utter stupidity she agreed in the non-agreement in December to no hard border and 'close regulatory alignment'. As far as the EU is concerned, we now learn, the non-agreement states that if there is no agreement, then Northern Ireland would be considered to be part of the EU customs union. Theresa was clearly having a micro-sleep when that one went past her. In the meantime no hint of a resolution of the problem has come from the British side. Failing that, the 'not legally binding' agreement has now become the default position. That pleases the Republic of Ireland, who have most to lose by a separation, but sticks it to the UK. How the Ulster patriots will feel when their century-long resistance to union with the Republic of Ireland is now finally lost and they have to go through the 'other countries' gate at UK ports and airports – well, we can probably guess. Dim Theresa and her dim helpers need to realise that EU leaders have all grown up in the tough world of European local and national government politics and proportional voting systems. They are also wafting from language to language, which allows nuances that can be endlessly massaged in translation. When it comes to squeezing a deal out of nothing they make the British bumblers look like amateurs. Above all, they are not your friends. Theresa May seems to assume that a meeting with the EU is a meeting of a group of reasonable, like-minded friends who just want the best for each other. Nothing could be further from the truth. They want to win and will do everything they have to to achieve that goal. The Eurocrats don't really want that uncongenial country Britain in the EU, but for its huge budget contribution and its trade defict with the bloc they will make an exception. She is not alone in her childish simplicity. 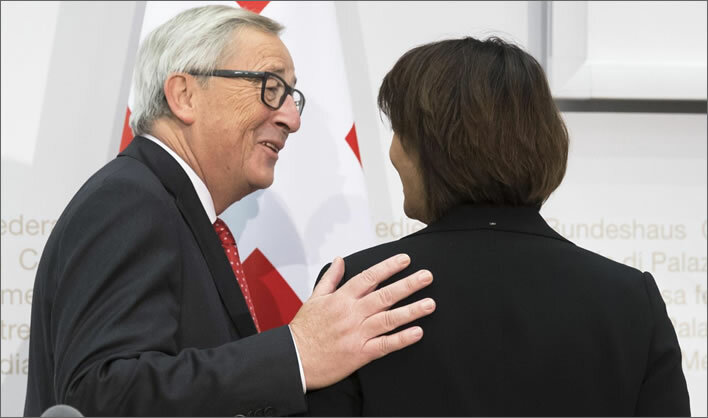 Last November Jean-Claude Juncker was in Switzerland. 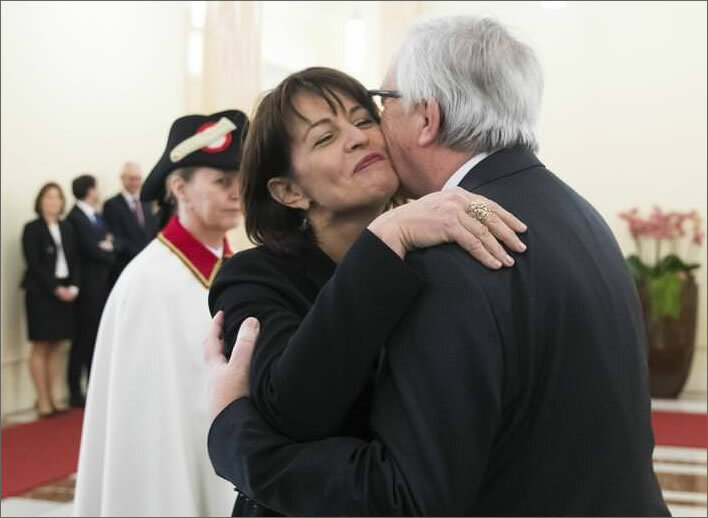 The President of Switzerland for that year, Doris Leuthard, put on a display of such toe-curling, grinning (she has lots of big teeth) and girlish intimacy that many Swiss were quite shocked to see their President behaving in such a fashion. In the end, which is what matters, it did her no good at all. As the NZZ put it: ultimately it will be Realpolitik. When Jean-Claude met Doris. Two Presidents at it in broad daylight. Even the usher has that 'get a room expression' on her face. Perhaps she is just thinking 'I'll have what she's having'. Image: NZZ / Peter Klaunzer / Keystone. Juncker came and went, and Switzerland not only ended up on an EU financial 'grey list' of countries, but was still being coshed by the EU over the establishment of a framework treaty. Switzerland still has to pay the EU a 'cohesion contribution' of around a 1.3 billion CHF over ten years, even though it is not in the EU. 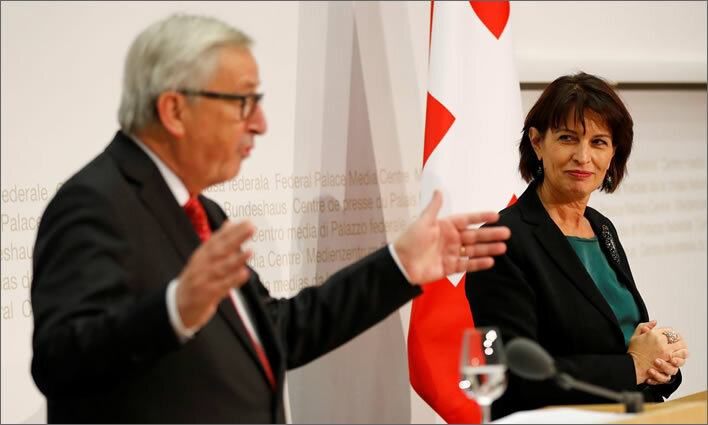 Switzerland had no cards to play and no backbone to play them even if it had – and Juncker knew it. He let Leuthard do all her lovey-dovey stuff then whacked the country anyway. Don't take our word for this: the article at the link is by a long-serving member of the EFTA court, someone who knows whereof he speaks. Jean-Claude with open arms. The look on Doris' face says it all – tonight's the night, you Luxembourg rascal! Image: NZZ / Stefan Wermuth / Reuters. Love blossoms in the desert of stony-faced suits. Jean-Claude, that Luxembourg cavalier, even gets the biscuits. '… you may see a stranger across a crowded room, and then you will know…' Image: NZZ / Stefan Wermuth / Reuters. 'La terre se bouge pour toi, Doris, ma p'tite?'. 'Mais oui, Jean-Claude – OUI!' Image: NZZ / Stefan Wermuth / Reuters. … and got well and truly stiffed.